Susan Eisenhower’s appointment to the Commission on America’s Nuclear Future will be the third time in as many administrations that she has served on Blue Ribbon Panels related to nuclear issues. In the spring of 2000, the Clinton Administration’s Secretary of Energy, Bill Richardson, appointed Ms. Eisenhower to the Baker-Cutler Commission to evaluate U.S. funded nuclear non-proliferation programs in Russia. In 2004, she was appointed by the Bush Administration’s Secretary of Energy, Spencer Abraham, to the Sununu-Meserve Commission, co-chaired by former New Hampshire Governor John Sununu and Carnegie Institution President and former Nuclear Regulatory Commission chairman Richard Meserve. Its influential final report, Moving Forward with Nuclear Power: Issues and Key Factors, provided many recommendations that were later adopted as national policy. In addition to these efforts, she has also served on a DOE funded study on terrorism and radiological dispersion devices (RDDs) or “dirty bombs.” At the end of last year, she also served on a DOE panel that produced recommendations on nuclear energy for incoming Secretary Chu. Ms. Eisenhower has written on the subject of nuclear energy, convened working groups on it through the Eisenhower Strategy Form and has visited many sites that are part of the larger nuclear question. In 2004 she visited: Yucca Mountain, the Federal Spent Fuel Repository in Nevada, which is now no longer being funded; a major uranium enterprise in Ust-Kamenogorsk, Kazakhstan, where highly enriched uranium is blended down; and several nuclear facilities in France including La Hague, the French reprocessing facility. She has also visited a number of Russian nuclear reactors. Her work for the Baker-Cutler Commission also took her to Russia’s premier nuclear weapons facility, the Zababakhin Center in Snezhinsk (formally Chelyabinsk-70), a sensitive Russian defense site where nuclear weapons are designed and fissile materials are secured. An experienced public speaker to expert audiences as well as general audiences, Ms. Eisenhower has addressed the issue of security and nuclear energy at many prestigious gatherings. These include keynote addresses at Lawrence Livermore National Laboratory in California; Sandia National Laboratories in New Mexico (The Distinguished Truman Lecture); and the National Academy of Sciences in Washington DC. She also gave the 2008 Rose Lecture at MIT and spoke during the General Assembly of the International Atomic Energy Agency in 2007. She has penned articles about the future of nuclear energy for such publications as the IAEA Bulletin and the National Academy of Science’s Issues in Science and Technology. 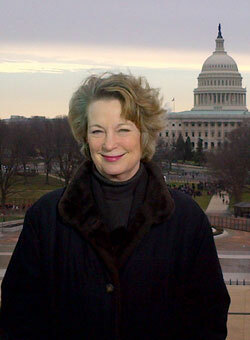 Susan Eisenhower served for three terms on the National Academy of Sciences standing committee on International Security and Arms Control. She is a founding Director of the Nuclear Threat Initiative (NTI) co-chaired by former Senator Sam Nunn and Ted Turner.